There is nothing as elementally atmospheric as hearing live music filtered through a redwood forest. The higher up you are on the mountainside, the more clearly sound drifts, and you feel at once gathered into community, part of the pulse, without ever leaving your yard. The trumpet player practicing in the next neighborhood over, the kid on his electric guitar in a garage somewhere lower down the hill, the tribal echo of someone’s twilight hand drum ritual from some wooded shrine just out of sight…Henflings on a good night in the summer. I was making my own contribution to the forest vibe one evening playing music with friends on the porch when a voice called out from the street below. It was my neighbor at the time, Mardeen Gordon, a Celtic music enthusiast out for an evening stroll who had stopped to share her joy in discovering a kindred sound. With ties to Strawberry Music Festival and other musical outlets in common, a friendship was ignited and set to simmer on a back burner. In September 2014 I found myself again providing a musical backdrop for Mardeen: Her fine art hand embroidery was being featured at the Om Gallery for the First Friday Santa Cruz art walk. 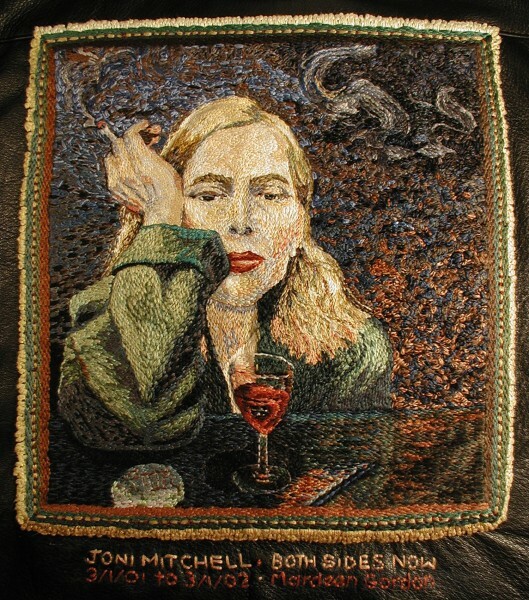 Joni Mitchell was there, as was Harry Potter, captured in living color, lushly tactile. Squinting to define the impressionist brush stroke, the works of Vincent Van Gogh and Leonardo Da Vinci leapt from the wall in silky resplendence. “My first embroidery project was a denim jacket that my mom, sister and I embroidered for my dad. Then I started doodling on a pair of cutoff Levi’s, from about age 12 to 25, eventually covering every inch of them except for the Levi’s tag on the back pocket.” She still has both of those early pieces. Mardeen said, “I was inspired by my study of art history in college, especially the Impressionists, who used tiny bits of color side by side to create an image full of life and texture.” She thought, “I could do that with thread!” She used a postcard of Van Gogh’s Starry Night as her example, embroidering the image by hand stitch-by-stitch onto the back of her husband’s denim jacket. That was in 1988. Mardeen’s art is a product of passion, both time-intensive and painstaking. To reproduce the smooth, subtle color changes in skin or hair, for instance, she splits the six-stranded floss into separate strands and in places stitches one color over another to simulate the blending of paint. Whether the finished piece will be worn on a jacket or displayed on a wall, the initial image is transferred with the help of a computer. Nuances of color and detail require countless hours of careful study of the original image so that the finished piece is indeed a masterpiece. “Right now, I am completing my first commission, with two more lined up after it,” she says. Prints of Mardeen Gordon’s embroidery masterpieces are on display at Burger 9, 15520 State Route 9, Boulder Creek, CA 95006. Original pieces are displayed through January 2015 at the Soquel Water District office at 5180 Soquel Dr Soquel, CA 95073.